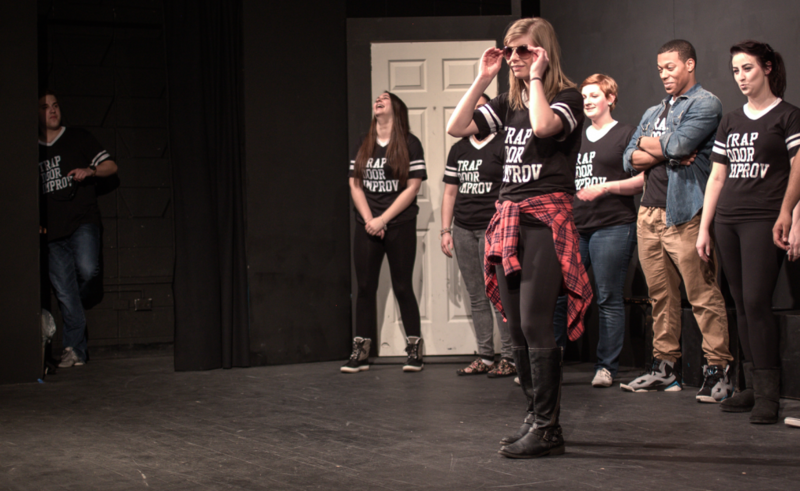 A Look into the Laughter: Trap Door Improv | Grand Central Magazine | Your Campus. Your Story. Moore 102 was packed with over 200 people who came to watch the members of Trap Door Improv use quick wit and puns galore to keep the audience roaring with laughter last Wednesday night. A couple examples included “Handout,” which involved bringing up members of the audience to help the performers finish their sentences, and “Montage,” an extended game involving multiple scenes with on-the-fly dialogue from the performers. The group tried to mix it up with a different combination of games for each show. While “Handout” was the only game to physically bring the audience on stage, every game involved some form of audience participation, mainly shouting out names of people, places or things that the performers had to use. The current ensemble has 15 members with a mix of freshmen, sophomores, juniors and seniors. With several new members, the chemistry was dynamic and everyone with minimal errors. Another impressive thing about the group is the variety of majors that the members have. 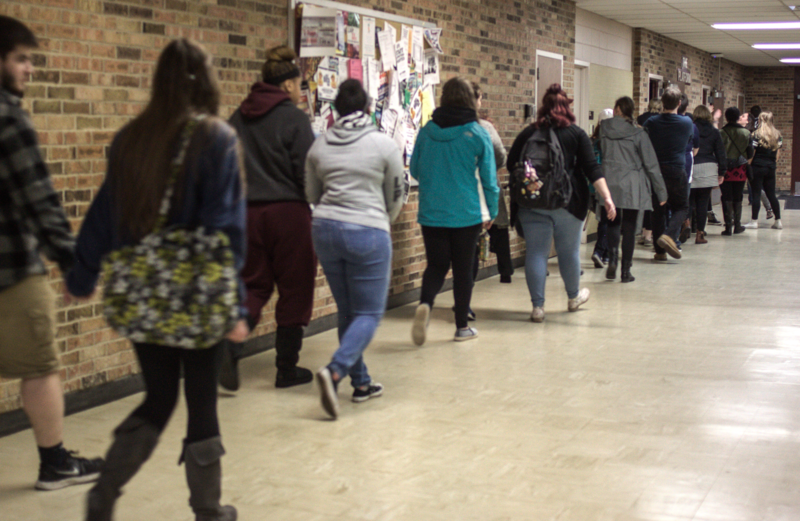 You’d think that they would be mainly theatre majors or something along those lines, and while some are, there are also english, music, broadcast and cinematic arts and even a communication disorders student. 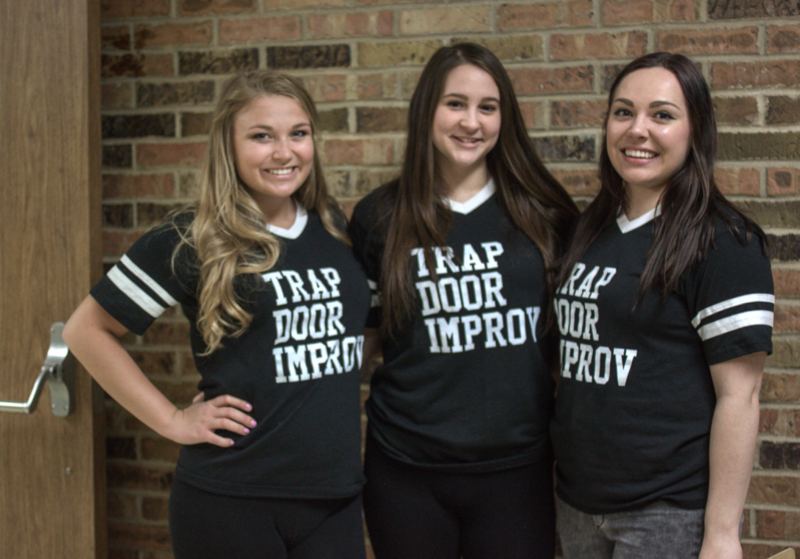 Trap Door Improv has two more performances this semester – Saturday, April 9 at 10:45 a.m. in the Indoor Athletic Complex at Relay for Life, and one final set of performances on Saturday, April 30 at 6 p.m., 8 p.m. and 10 p.m, the latter of which will be the send off show for five of its members. Separator image Posted in Arts & Entertainment, Events and tagged with Arts & Entertainment, Bailey McDonald, CMU Improv, Conner Emery, TrapDoorImprov.